Kohler Co. leads the way in design, craftsmanship and innovation - knit together by uncompromising quality. Kohler's product offering spans across all price points, offering a wide variety of options in kitchen and bath fixtures and faucets, furniture, cabinetry, tile and stone. As the recognized industry leader and best-known brand name in kitchen and bath design, Kohler offers products and services to create a complete design solution. Expanding upon KOHLER's distinguished line of Intelligent Toilets, the new Eir Intelligent provides an added level of graciouness to any bathroom space. Utlizing an intuitive touchscreen remote, take complete control of the experience from heated seat levels to adjustable bidet sprays and water temperature. A UV-sanitized, stainless steel wand paired with a feature that mists the bowl prior to use ensure consistant cleanliness. Eir showcases a sleek, modern look with an elegant finish strip on the lid that allows for design personalization. The Google Assistant-enabled Verdera Voice mirror brings optimally bright, shadowless light and full stereo sound to your bathroom with convenient voice command. All you have to do is Ask Google, and your Verdera Voice mirror allows you a hands-free bathroom routine. Using Google is as simple as asking a question. Just ask to adjust the lights to the ideal brightness for any grooming activity, play music, get the weather, tell a joke, and more - Google will respond instantly. You can even make middle-of-the-night bathroom trips less disruptive with a motion-sensing night-light. 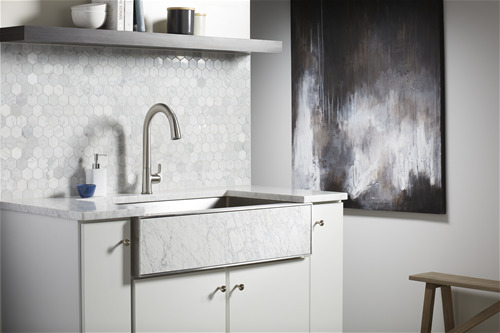 The new Tailor Farmhouse Sink showcases Kohler's continued leadership in innovation, design, and personalization. The Tailor Farmhouse Sink has a customizable apron that allows the homeowners and specifiers to choose their own material own materials and designs that suit their design style and their kitchen's aestheitc. This freedom of choice allows for added coordination with surrounding kitchen materials and designs. Custom designs and materials can be easily inserted into the apron or Kohler offers the ability to choose from six (6) Kohler-curated front panel designs that include etched stone, carved stone, and graphic inserts. Lavender Grey: A soft, feminine hue inspired by muted lavender tones and foggy sunsets, Lavender Grey can satisfy both a tranquil or whimsical intent. This color is neutral enough to quietly exist but colorful enough to effortlessly standout. It is versatile in warm to cool settings and pairs elegantly with natural materials and finishes to blend seamlessly into an interior. Black Plum: Our boldest, most seductive color in the collection, Black Plum is a statement piece for the fashionable and daring. 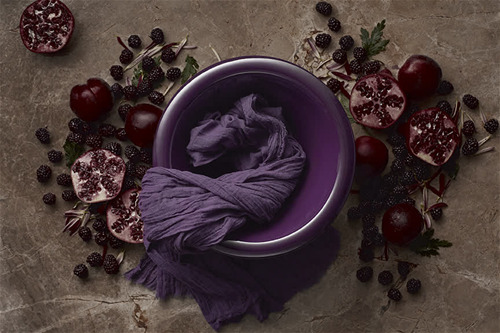 The warm hue is inspired by dark saturated purples found naturally in fruits and vegetables, and deep moody hues emerging in modern fashion. Carrying an ode to victorian history, this finish denotes a perception of royalty and luxury. It can elegantly adapt to a traditional setting or contemporary interiors, making it both versatile and distinct. Indigo Blue: Indigo blue is a rich, saturated finish celebrating the authenticity of natural indigo dye in a new fashion. This deep blue is captured beautifully by the dimensional quality of cast iron enamel. It provides an understood yet unexpected refresh to the navy blue category. Although cool in nature, it carries just a touch of warmth which eases fluently into trendy coastal settings or nautical themes.